Heather Hirsch, a school climate consultant for Minnesota Department of Education, presented "Student Bullying: How Can We Respond?" 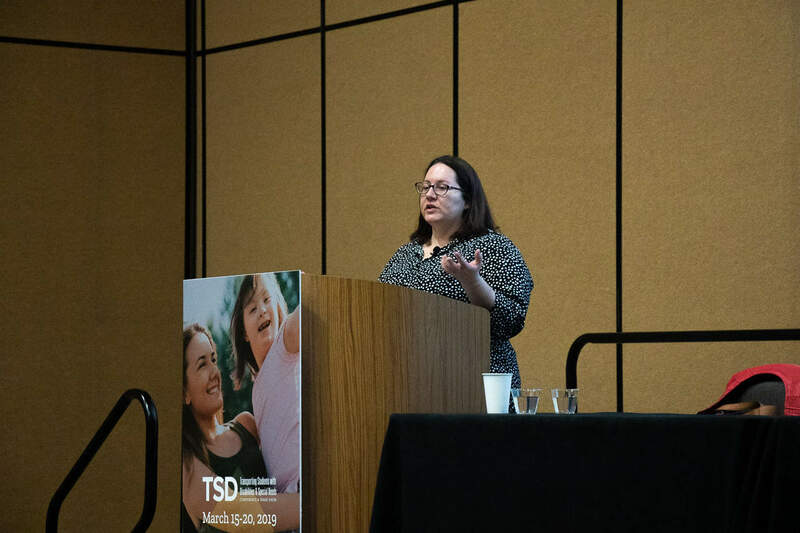 at the TSD Conference on Monday, March 18, 2019. FRISCO, Texas — Unchecked impacts of bullying can follow students for the rest of their lives, resulting in post-traumatic stress, a certified bullying intervention trainer shared with TSD Conference attendees. Heather Hirsch is also a school climate consultant with the Minnesota Department of Education. She discussed how to recognize students being bullied and what adults can do during her keynote presentation at the 2019 TSD Conference. Hirsch said that bullying can be defined as an imbalance of power. It includes aggressive behavior that is usually repeated over time or in different locations throughout school. Common victims of bullying include students with disabilities, or those of different races and religions. The school bus is an extension of the classroom and must also be safeguarded from the behavior. Bullying comes in several different types, yet should not be confused with a conflict. Conflicts, she added, are usually a one-time disagreement between friends and there is usually a sense of remorse after. Meanwhile, bullying may be repeated over time and is usually an intentional act resulting in physical or emotional harm. The victim can be subjected to verbal, social, physical or cyber attacks, and the adults around the student need to be aware when these instances take place. When bullying goes unchecked, what starts as playful behavior could result in the bully becoming violent and is therefore more likely to commit acts of assault. For the victim, however, bullying could be experienced as a form of a trauma, resulting in recurring memories throughout adulthood. Hirsch said the conversation regarding bullying must change, and that it should no longer be viewed as simply children being children. Adults need to be trained to recognize bullying and reporting it whenever a situation occurs. She added that a child could be bullied at various locations throughout school, but the school bus driver may not be aware the child was bullied at lunch, if the proper personnel does not report the incidents. What Can Student Transporters Do? While bullying can cause depression and anxiety, it could also result in school avoidance, health complaints and post-traumatic stress. Hirsch said the first step of any adult is to intervene in the situation. She added it’s okay to get another adult involved, but she said to stay calm and use model respectful behavior. Hirsch said that it’s not a choice, you must act, and you must report the incident. When school bus drivers notice bullying, Hirsh said they should address the situation as soon as possible. She advised speaking with the bullied student privately, for example, while they are exiting. Bus drivers should assure the student that the incident will be reported, and that the driver is available to talk about it. Hirsch said to make sure the student knows that you saw the behavior and that behavior will not be tolerated. As bystanders, other students are encouraged to step in when they see bullying as well. Hirsch said studies show that bullying incidents stop within 10 seconds of peers intervening. School districts are affording students more opportunities to report bullying, including using apps to submit anonymous tips, as well as written and verbal statements. Hirsch advocated training your students to stand up for their peers who are being bullied. Dana Acock, director of transportation for Grand Prairie ISD in Texas, told School Transportation News following the general session, that she started a training session with her bus drivers called, “See it and Say it.” Acock said the first half of the training focuses on how to spot bullying, and what to do, while the second half focuses on human trafficking. One reason the training originated was because bullying is not just kids against kids. Acock said an elementary student accused a bus driver of bullying her. Acock said her bus driver only viewed the incident as innocent teasing that was not meant to be malicious. However, as Hirsch discussed, teasing can be a form of bullying if taken too far. After receiving the district training, Acock said her bus drivers also wanted to empower their students on the bus to report bullying. The district made plaques encrypted with CR codes for each bus. If a student scans their phone over a plaque, a bullying incident report is submitted directly to school counselors. Acock added that about 20 percent of all reports are investigated and later determined to be a form of bullying. Hirsch recommended creating a bullying policy at school districts that all personnel must be trained on and adhere to. Many attendees at the general session said they need to train their bus drivers better to recognize these behaviors and to know what to do in these situations. “Learning to apply it to a bus and actually how we can work better with the schools to solve some of these bully problems, it was wonderful information,” said Richard Eddington, director of transportation for Park City School District in Utah. Hirsch said she has heard of schools using a hotspot mapping system that allows students to place a sticker on an extended map of the school that indicates locations where they don’t feel safe or have been bullied in. The school district can respond to the map by placing more adults in these selected areas.